Today’s chapter concerns sculptor #MatteoCivitali (1436–1502) and etcher Charles Callahan Perkins. Civitali was a sculptor, architect, painter and engineer from Lucca. He was born in Lucca, Italy and much of his work can be seen there. He studied in Florence under artists Rossellino and da Fiesole. Civitali appears to have taken up sculpting around the age of 40 after practicing as a barber/surgeon. Civitali was a leading artistic personality of the Early Renaissance. He is known to have sculpted statues of Adam, Eve, Abraham, Zacchariah and Elizabeth, and others for the chapel of San Giovanni Battista in Genoa. 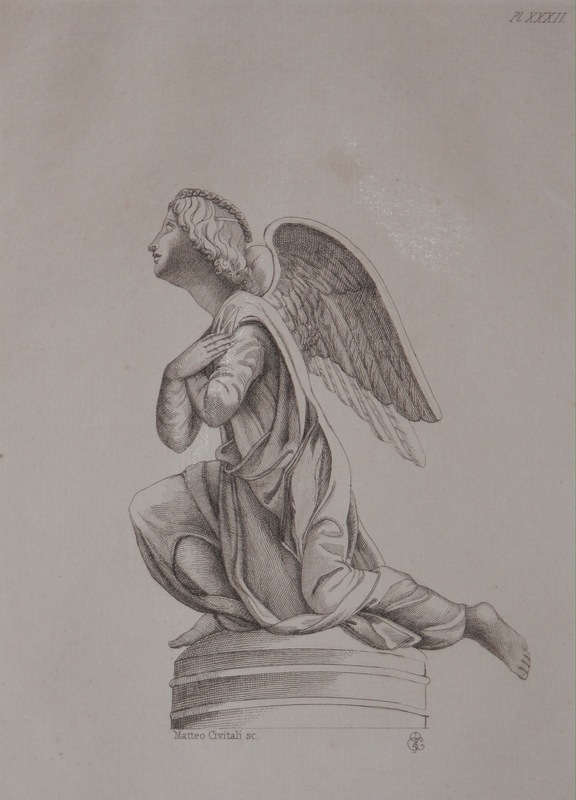 The etching (book plate) I acquired this week is produced from one of Matteo Civitali’s sculptures. The #adoringangel and it’s counterpart were sculpted for the Duomo in Lucca, Italy. There is an emotional content to his sculpture which is not regularly seen in Florentine artworks. His Christ is a man of sorrows, his angels are adoring and worshipful, and his Madonnas are tender-hearted. The etching cites Civitali in the lower left, in the lower right the monogram of the etcher CCP (or PCC/CPC) and in the upper right we see it’s plate number for the publication from which it comes (undetermined). If the order is CCP, the artist/author maybe #CharlesCallahanPerkins (1823-1886). An American, born in Boston, Massachusetts, educated at Harvard, eventually, he studied art in Rome and Paris. Two of his books were ‘Tuscan Sculptors’ and ‘Italian Sculptors’ published in 1864 and 1868, respectively. He was an art critic, author, organizer of cultural activities, and an influential friend of design and of music in Boston. Charles Perkins deserves a chapter for himself in regards to his contributions and influence on the arts in North America in the second half of the 19th century. Charles Callahan Perkins helped found the Museum of Fine Arts at which he was an honorary director. Clean, finely executed lines breathe beauty, reverence and tenderness into this angel.